Correct ME if I’m wrong but ALL you men have gone through this situation haven’t you? You threw a house party and it was turning out to be crazy FUN until that beautiful lady stepped out of the washroom and gave you FILTHY stares for the rest of the evening? Okay not ALL but most of you? Now imagine a situation where you’re MADLY in love with a woman, you get her home and she’s TOTALLY disgusted by the way you’ve maintained your toilet. Awwww, didn’t want to disappoint her, did you? Well, don’t you worry, we are here to help you make a solid impression on the love of your life. For the sake of privacy, yours as well as that of others, keep the door firmly closed at all times while conducting your business. In fact lock it just to be sure. Okay grab a notepad and write this down ‘The toilet seat ALWAYS stays down’. 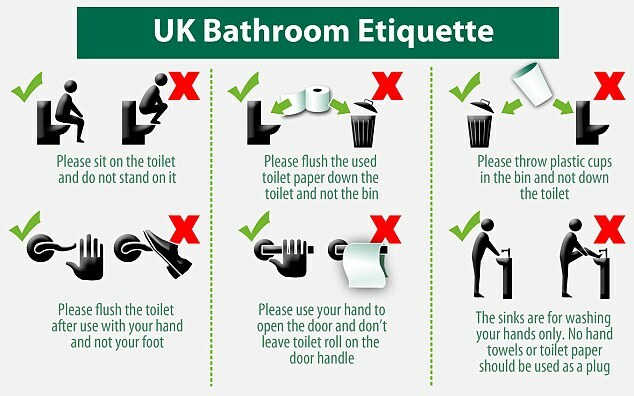 Do this to not just showcase your good manners but also for the sake of hygiene; it has been scientifically proven that if the seat isn’t down flushing the toilet can contaminate objects like toothbrushes that are within two feet of the commode. Not just the seat, also ensure that you keep the seat cover down, that way you’d earn extra brownie point with the ladies. Boys, stand close enough to the pan or urinal so you don’t dribble on the floor and please concentrate when you pee so you don’t wet the seat, walls or floor. If you’re UNSTEADY on your feet, sit on the pan but never ever leave the seat wet. And don’t forget that ANY cleaner would contain Hydrochloric Acid so use a pair of rubber gloves so you don’t burn your hands. Try to keep potty sound to a minimum. I mean we know that such ‘natural sounds’ are hard to control, but try, ok? Save yourself the embarrassment and just buy some air freshener. Stick to basic unisex scents that aren’t too overwhelming – after all, you don’t want to smell like air freshener. Pro tip: If you run out of air freshener, just light a matchstick before you step out of the toilet. That won’t make it smell as pleasant as, say, roses but it would help deodorize the area. Unpleasant smells are because of gases which get oxidized due to the flame. Want some bonus brownie points? Keep fresh and clean towels to win bonus points. Something that bothers every girl is dried toothpaste stains on the washbasin. Make sure you keep an eye on that and scour the rest of your washroom for soap scum or any other mystery stains. It’s best to tackle these once a week to prevent major buildup. Don’t ever forget to flush the toilet after your business is done – after all it wouldn’t get better with time, it’s body waste NOT wine. Before you comment on boys, try writing something for girls. I have seen many girls not using the toilets properly and that’s because of not having proper knowledge. Don’t point out mistakes in guys. Just a suggestion , try writing for both boys and girls. That would be common. Coz everybody makes mistakes!! LOL Namya Great article! You made my day. Greetings! A lot of people pee over and outside the commode. Secondly, some people sit over commode with shoes. It causes dust on commode. In GCC countries, many times found water on the floor of washroom. Why?